As the Rolling Stones took to the Pyramid Stage 10 minutes after they had been scheduled to start, fireworks flared on both sides of the crowds. Sir Mick Jagger, wearing a green glittered jacket, then bounded into view to launch into an energetic version of Jumping Jack Flash. Before going into It's Only Rock And Roll But I Like It, Sir Mick told the thousands of festival goers: "How are you feeling? You feeling alright? It's great to be at Glastonbury!". They had been introduced to the stage with the words of festival organiser Michael Eavis, who said in a recording boomed out to the masses: "We've waited a long time for the Stones to play. For them to be here is brilliant." He is said to have tried to secure the gig for years. 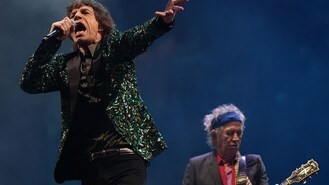 Sir Mick said before beginning third song Paint It Black: "This is great. I want to tell you something - it's great to be doing this show, doing this festival. You all look amazing." He then jokingly added: "After all these years, they finally got around to asking us. Thank you Michael." Anticipation had built in the hours before the gig began, with the crowds breaking into impromptu sing-a-longs of Stones classics. Banners were held aloft by fans young and old, one reading "Satisfied" and another of the Stones' lips logo. It took 90 minutes to build the set, with the band said to have wanted to time to ensure the best possible sound quality. An hour of the show was broadcast to fans at home but the lucky 135,000 ticket holders enjoyed the full two hours and 15 minute set. Celebrities including Kate Moss and husband Jamie Hince, Stella McCartney, Wayne and Colleen Rooney, Lily Cole were among those in the audience of thousands in front of the Pyramid Stage. There was alternative entertainment, from Public Enemy and Chase & Status, but it seemed from the size of the crowd that everyone had decided to see the Stones. Those who did were treated to a brand new song called Glastonbury Girl, a folky number that made references to tepees, fellow Pyramid Stage performers Primal Scream and contained the line: "Waiting for a girl - she took all my ecstasy." Sir Mick said he had indeed been sampling the delights of Glastonbury Festival - including late night clubbing area Shangri-La. He said: "Are we doing alright? We came here last night. I went around and had a wonderful time. I went to Shangri-La. I saw the Arctic Monkeys. I couldn't get up the tower - the queue was too long. But I did see a few people. I did this song for a girl I met." The band then segued into Wild Horses, with thousands singing along to the chorus, followed by last year's release Doom And Gloom.